Written by Patricia Faulk, Teen Leader. Edited by Anna Prince, Teen Leader, and Amy Jernigan, Café Coordinator. 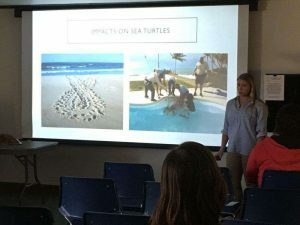 Amy Windle talks to teens in North Carolina about her work with Sea Turtles. Get ready to travel the beach to see eye-to-eye with the struggle that sea turtles face during birth and breeding. 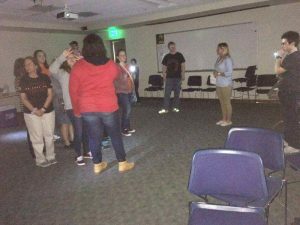 In this TSC, teens observed the impact that light pollution has on sea turtles through both a presentation and a creative, accurate activity. With the heavy development on beaches, the amount of light at night has increased heavily, provoking problematic situations for our favorite reptiles of the ocean. Anna Windle, who did her research at Duke University’s Marine Lab, led the teens into a discussion at the café. Sea turtle hatchlings are meant to find their way to the ocean by following the light of the moon. As many beach-goers may know, the light produced from people’s houses along the coastline confuses hatchlings. This causes them to travel in the opposite direction of the ocean. Windle proved this further by exercising a controlled experiment. Hatchlings are normally guided to the ocean by rows of fabric barriers, running perpendicular to the ocean. In her experiment, Anna placed the barriers parallel to the ocean. The result of the experiment was expected; the hatchlings scurried in random directions rather than traveling directly to the ocean. 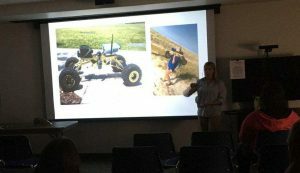 To complement the results from her experiment, Anna developed and operated a robotic land rover at the eye-level of sea turtles to measure light intensity along various North Carolina beaches. This provided evidence that the light intensity was too strong on the beaches. Anna WIndle talks to teens about her use of robotic land rovers that measure light intensity at the eye levels of sea turtles. Windle also proved that birth isn’t the only stage of life where sea turtles are influenced by light pollution. “Sea turtles prefer to lay nests in darker environments,” says Anna Windle after a survey of light pollution on a beach; “We found that the more light pollution there is, the less likely a mother sea turtle will lay her eggs there.” This might sound beneficial for the sea turtle at first, but after further analysis, it could be just as harmful for the baby sea turtles. If too many sea turtles nest on one beach and a natural disaster occurs or predators find the site, then all the eggs of the endangered sea turtles are lost. Although it may seem hopeless for our endangered friends, Windle’s efforts, along with countless volunteers, greatly improve the outlook for their species by protecting the hatchlings. The activity reflects Windle’s findings after her research. Six teens volunteered for a role while the other teens gathered in the center. Four of the volunteers acted as light sources–houses, hotels, light poles, and a moon–and each was given a flashlight. The other two volunteers represented predators: a raccoon and a bird. All the other teens played the roles of baby hatchlings. After the lights were cut off, the light sources cut on their flashlights and the sea turtles had to quickly scurry to a light source without knowing which light was the moon while the two predators tagged out the hatchlings. Once this activity was conducted several times, the results were the same; only one or two (if any) sea turtles made it to the ocean. The others went towards the lights produced by houses or poles. This activity reflects the somber reality faced by hatchling sea turtles. The teens left the café with the knowledge of a sea turtle’s survival story in their brain, and a passion to help them in their heart. You can help these endangered creatures, just as Anna Windle and countless other volunteers have, by volunteering at the nearest beach that hosts sea turtle nests. Even one moment of your devoted time can change the future for sea turtles. If one moment can change the life of one sea turtle, imagine how much you could change the community around you.